Do you want to remove paper-based processes when your customers need to sign contracts or other documents, to save time and money? With our APIs you can create a smooth digital signing process however and wherever you need it, and vastly increase efficiency in your business processes. We handle the whole value chain of getting a document signed, from creation and distribution to sealing and storage of the signed documents. Our solutions are flexible, so that you can customize the different steps in the process to meet your requirements. Our APIs support integration of digital signing processes online on your webpage/app or by sending documents to recipients through email and SMS. We support signing with national eIDs and by means of other methods such as handwritten signatures on screen. 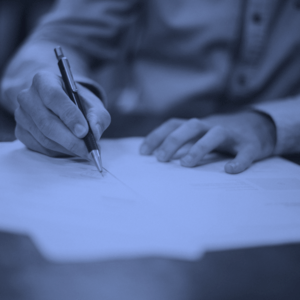 The signed documents follow the European eIDAS standards, so you can be certain that no one can tamper with your documents, and you can meet compliance requirements for non-repudiation and document integrity. With an asynchronous digital signing process, you can set up arbitrary many recipients of a document, as well as send out notifications by email and SMS to those who should sign the document. When the document is signed, the API returns a document file in the format of a PDF Advanced Electronic Signature (PAdES). This PAdES contains information about who signed the document, when the signature was added and a validation of signature at the time of signing. Get rid of your slow and costly paper-based processes. Open a free test account and get started today!